Farrar, Straus and Giroux, 9780374190668, 224pp. As the Foreign Affairs columnist for the The New York Times, Thomas L. Friedman is in a unique position to interpret the world for American readers. Twice a week, Friedman's celebrated commentary provides the most trenchant, pithy,and illuminating perspective in journalism. 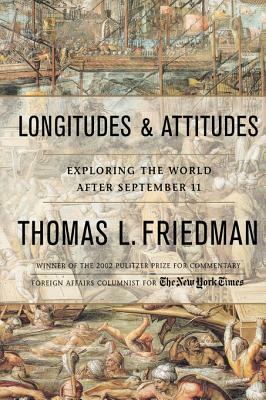 Longitudes and Attitudes contains the columns Friedman has published about the most momentous news story of our time, as well as a diary of his experiences and reactions during this period of crisis. As the author writes, the book is "not meant to be a comprehensive study of September 11 and all the factors that went into it. Rather, my hope is that it will constitute a 'word album' that captures and preserves the raw, unpolished, emotional and analytical responses that illustrate how I, and others, felt as we tried to grapple with September and its aftermath, as they were unfolding." Readers have repeatedly said that Friedman has expressed the essence of their own feelings, helping them not only by explaining who "they" are, but also by reassuring us about who "we" are. More than any other journalist writing, Friedman gives voice to America's awakening sense of its role in a changed world. Thomas L. Friedman is an internationally renowned author, reporter, and columnist-the recipient of three Pulitzer Prizes and the author of six bestselling books, among them From Beirut to Jerusalem and The World Is Flat. He was born in Minneapolis in 1953, and grew up in the middle-class Minneapolis suburb of St. Louis Park. He graduated from Brandeis University in 1975 with a degree in Mediterranean studies, attended St. Antony's College, Oxford, on a Marshall Scholarship, and received an M.Phil. degree in modern Middle East studies from Oxford. After three years with United Press International, he joined The New York Times, where he has worked ever since as a reporter, correspondent, bureau chief, and columnist. At the Times, he has won three Pulitzer Prizes: in 1983 for international reporting (from Lebanon), in 1988 for international reporting (from Israel), and in 2002 for his columns after the September 11th attacks. Friedman's first book, From Beirut to Jerusalem, won the National Book Award in 1989. His second book, The Lexus and the Olive Tree: Understanding Globalization (1999), won the Overseas Press Club Award for best book on foreign policy in 2000. In 2002 FSG published a collection of his Pulitzer Prize-winning columns, along with a diary he kept after 9/11, as Longitudes and Attitudes: Exploring the World After September 11. His fourth book, The World Is Flat: A Brief History of the Twenty-first Century (2005) became a #1 New York Times bestseller and received the inaugural Financial Times/Goldman Sachs Business Book of the Year Award in November 2005. A revised and expanded edition was published in hardcover in 2006 and in 2007. The World Is Flat has sold more than 4 million copies in thirty-seven languages. In 2008 he brought out Hot, Flat, and Crowded, which was published in a revised edition a year later. His sixth book, That Used to Be Us: How American Fell Behind in the World We Invented and How We Can Come Back, co-written with Michael Mandelbaum, was published in 2011. Thomas L. Friedman lives in Bethesda, Maryland, with his family.